Okay now, tell me, is it ok to decorate for Christmas with pumpkins? Cause I am going too….. 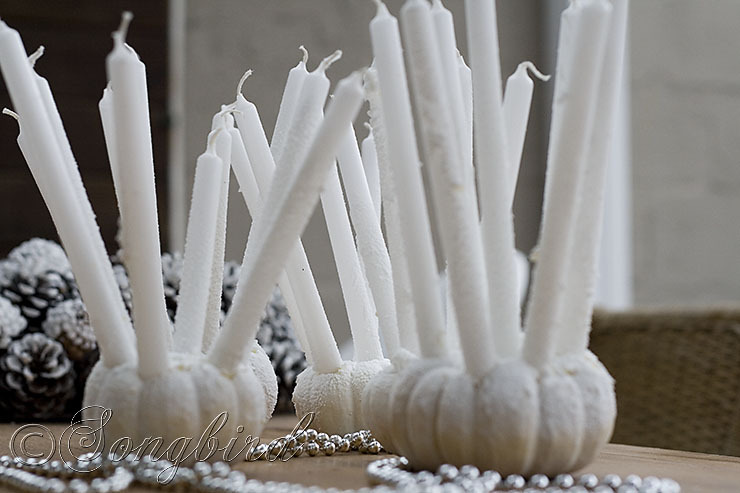 Remember my mini white pumpkins I found and used for Fall? Until yesterday they were part of my blog banner, so if you’ve been here lately you might have caught a glimpse of them. I was taking them away earlier to make room for a little more Christmassy stuff and I was about to throw them in the trash, when I started to hesitate. What if…. They were still strong and fresh, although hardly white anymore, they had turned a dodgy yellow. But throwing them away? It seemed like such a waste. And then I came up with this. Drilled holes for a bunch of very small candles and then sprayed the heck out of it with fake snow. I think I saw this somewhere, sometime, but for the life of me I don’t know where. I didn’t find it googling images of pumpkin candlesticks nor on Pinterest. So it probably was a long forgotten book or magazine that somehow left a spark of inspiration in the depths of my brain. Anyway this was real easy and real quick. The hard part was finishing on time so I would still have time to photograph them. They hadn’t even dried properly when I put them on the table for their moment of glory in front of the camera. I think I will give them one more layer of snow tomorrow. Don’t know yet where I am going to use these. Somewhere where I will not be tempted to light those candles I guess. So what do you think. Too far out there, or turned out quite nice? Pumpkins for Christmas no way, or why not? Can’t wait to hear what you think of this project……. Now I want a drill too! Love what you did! Perfect idea for all of those pumpkins I have left! !